Katelyn McGlynn, MPH, serves as the Institute’s co-Project Coordinator, working closely with Azam Masood to support the Florida Oral Health Alliance and Oral Health Consumer Engagement activities, as well as to provide assistance in the implementation of the medical/dental integration pilot. Katelyn received her Master of Public Health degree from the University of Miami and brings domestic and international experience in quality improvement in the healthcare system. 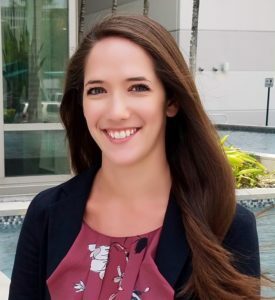 In her previous position at the Florida Department of Health, Healthcare for the Homeless Program, Katelyn’s work focused on integrating healthcare quality into primary care settings and providing patient-centered services to the homeless population. She is passionate about developing policies that promote equity in access to health care services, with a focus on local communities.